Important note: non-disclosure agreements keep me from providing specifics on this page. 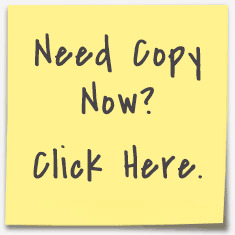 To get specific examples of copy, please contact me here. In 2013, I wrote copy for more than 40 clients who needed a reliable direct response copywriter. Meet a few of these clients. A small company here in Charlotte, North Carolina, entered four of the most competitive niches in the dietary supplements space. I helped them re-launch one product. Then I wrote copy for 3 new supplements. All the supplements have been extremely successful. The Charlotte Business Journal named the company its fastest-growing in 2013. Copy was tested extensively. Type of Company: Dietary Supplements. Direct Response Copy Written: AdWords. Display ads. Long-form copy. Advertorials. Emails. One of my long-term clients is one of Australia’s top digital advertising agencies. I provide them with direct response copy for long-form sales pages, landing pages, emails, and squeeze pages. The agency’s clients are from a wide range of industries including real estate, banking, solar energy, and plumbing! Type of Company: Digital Advertising Agency. Direct Response Copy Written: Long-form copy. Advertorials. Emails. Landing pages. Squeeze pages. Golf can be a difficult market to enter … for any company. However, this golf client has built an opt-in database of well over 1 million golfers. I have helped this client sell products, services, and instruction. One long-form sales page generated $1.6 million in direct sales. Type of Company: Golf Sales. Direct Response Copy Written: Emails. Long-form direct response copy. I rarely write blogs but one company persuaded me! I write a blog twice a month and it generates over 7,000 unique views each post. The subject is usually direct response copywriting or conversion. Type of Company: Internet provider. Direct Response Copy Written: Bi-monthly blog. I rarely work for local clients but 3 friends own a restaurant – in one of the most inconvenient locations on the planet. I helped them build an opt-in email database of over 1,600 emails. People on the list receive a free birthday dinner and this promotion has persuaded over 6,000 people to come to the restaurant, many for the first time. Email open rates for regular emails are 31% … industry average is 19%. Type of Company: Restaurant and Bar. Direct Response Copy Written: Emails. Copy. Autoresponders. I’m currently working with one of the world’s largest financial publishers. The project is a front-end video sales letter (VSL). I’m working with the director of marketing and the copy chief. Type of Company: Financial Publisher. Direct Response Copy Written: Video sales letter and long-form copy. Contact me now for a quote or to discuss a project.